Granular Activated Carbon (GAC) consist of irregular shaped particles with sizes ranging from 0.2 to 5mm. Granular activated carbons are made by activating the base material directly or after an agglomeration step. Grinding the raw material to an selected size to obtain the desired product after carbonisation and activation. Carbonisation and activation of the raw material and the activated product is crushed and sieved into the required granulometry. Agglomerated carbons are produced by pulverising a selected mixture of different coals to particles smaller than 45µm. The powdered coals a mixed with a binder, pressed to briquettes, broken to granules of the required size and then further processed to the required activity. Granular sizes from 0.2 up to 2 mm are usually used in liquid phase application because adsorption kinetics are more important than pressure drop. Granular sizes from 2 up to 5 mm are typically used for gas phase applications where normally the pressure drop more critical is compared to the adsorption kinetics. 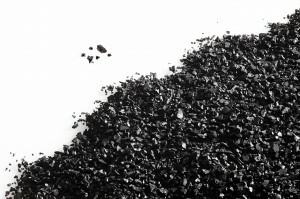 DESOTEC Activated Carbon offers direct and agglomerated activated carbons products in different sizes. Our technical specialists can help you to select the right size for your application. Contact us on granular activated carbon!